LM clutch cable too long ? Am converting 1965 cnvt. from PG to manual. Using 66-69 Saginaw transaxle. Everything is now installed. Problem is can't adj. slack out of clutch cable. End of cable hits front of trans. so don't see how any adj of clutch rod or cable swivel or problem with clutch assmy. can solve. Seems like a problem with routing or pedal assmy. Don't see any options for routing. Cable runs through pulley directly to arm on pedal shaft. Didn't think there were different LM pedals that could cause this issue. Did install cable pulley and cable is passing through pulley. Also all LM cables are same except end on 69? Could I have a wrong cable? Unfortunately I did not have a complete parts car so am using parts from various sources accumulated over a long period, so wrong parts is a possibility. Could just cut and rethread cable, but rather find real problem. Re: LM clutch cable too long ? Are you sure that the metal arm that the clutch pedal attaches to is not bent or twisted out of position (maybe rewelded in the wrong orientation)? I have seen a number of these failed , the flat bar that connects the cable comes loose at the rod which connects to the pedal, causing lack of movement. I have seen these welded back into place still twisted. Other than that, are all the correct parts installed (eg. is the pulley the correct one)? Do you have the correct cable? Is it the correct length? 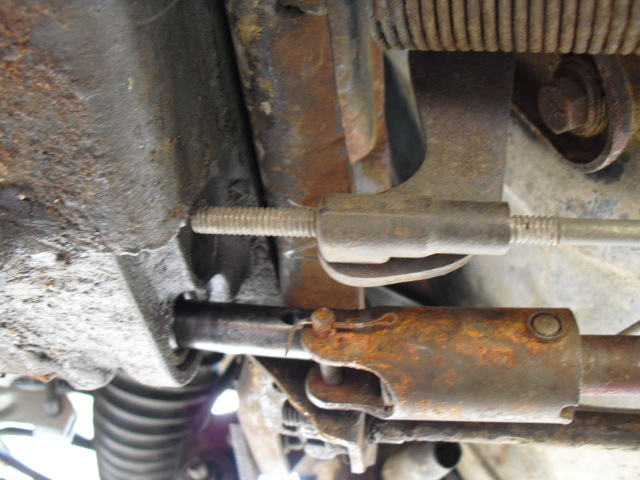 Is the clutch pivot at the rear of the car adjusted correctly...the cable is adjusted so that the lever that connects the main clutch actuating rod nearly hits the trans crossmember. The rod is then adjusted after the cable. Rechecking adjustments step by step from the shop manual would be a good place to start. Edited 1 time(s). Last edit at 01/10/2019 09:06PM by TerribleTed. 65/66 is one clutch/brake pedal assembly. 67/8/9 is another clutch brake pedal assembly. You need the common 65/66 assembly. I do not know why people buy the wrong car. But, I am jaded, as I lost a 69 pedal assembly out of a parts 69 2 door to loan to a friend who was doing a swap for a customer on a 67 PG to 4 speed swap one weekend and the car owner supplied the wrong pedal assembly. For my friend to get the job finished he needed the right pedal assembly. Of course all I got was excuses as to why the car owner was responsible to replace or pay for my 69 pedal assembly, someone I did not know, never met, had no contact information. Second time I got taken by saying "just get me a replacement" instead of cash. Learned lesson, no more loaning parts! Edited 1 time(s). Last edit at 01/10/2019 09:30PM by Frank DuVal. Did you use the white plastic pulley for the clutch cable in the tunnel? The black one is too small of diameter. What about the correct bolt and spacer for the pulley? That all makes a difference for lengths. Edited 1 time(s). Last edit at 01/11/2019 04:29AM by vairmech. Is that arm to the left of the 65/66 assy part of the parking brake assembly? If so, does the 67/8/9 not have that arm, but a different style of parking brake arm? I have the white clutch pulley mounted next to the black park brake pulley with the metal bushing. It is larger than the black park brake pulley and looks same as another one I have. The cable extends about an inch beyond the front of the transmission and cross piece hits trans so no help to adjust clutch rod. Think the pedal assmy. is the correct one. Understand the 67 -69 was different to accommodate a different steering column. Reused the park brake mount and just installed the pedal shaft with manual clutch and brake pedal. Didn't notice any reweld to the arm but will look again. Does anyone know what the length of the cable is supposed to be? I note the 66-69 Saginaw is longer than the 65 trans and requires a shorter shift shaft coupler so a shorter clutch cable would seem possible. However the parts book shows same number for 65-68 cable. 66 assembly manual shows same number and vendors sell one cable for 65-69. Also cable attaches to the cross shaft not trans so should be same length 65-68. 1/4x20 die to the threads if necessary. the position of trans mounting points etc. I have had to weld the arm back on the pivot shaft before. My '64 was very poorly welded and broke off when I tried to bend it a little to align the cable better. from 65-9. Nothing on early would apply here. and shortened the cable all looks ok now will see how it works. I understand they are different but if the arm breaks off and has to be welded back on that is the same area of error. Are you talking about this? I changed a 65 to 66 trans axle and had to trim the Threaded rod end as well so it would clear. Edited 1 time(s). Last edit at 01/11/2019 08:18PM by davemotohead. I’ve had to trim the threaded part of the cable many times. A streached and trimmed original GM cable is much better than a repop. That is the issue I have. Cut threads so now fits.